Our port is situated in one of the most popular areas on the UK for every conceivable type of water based leisure activity, and as a Harbour Authority, ABP Southampton has a responsibility to ensure everyone can use the water safely, and in harmony with each other. To help achieve safe and co-ordinated use of the Harbour Area, ABP (often in conjunction with neighbouring Harbour Authorities) has issued some useful guidance which can be found on this web site, and also provides services such as our recreational events listings to help organisers de-conflict any events they may be planning. Have you been involved in, or witnessed a marine incident? Please report it HERE. Following a fatal collision between a dredger and a yacht, in clear visibility, the MAIB have published a "Safety Flyer"reminding all mariners of the need to keep a proper lookout. In particular leisure sailors are reminded that commercial vessels may be approaching much faster than is first thought. Small Boat Safety - Use of "Kill Cords"
Following a tragic accident in Cornwall, during which a family of 6 were ejected from their Rigid Hulled Inflatable Boat (RHIB), leading to the deaths of two family members, and further serious injuries; the following advice has been issued by the Marine Accident Investigation Branch. Test them regularly to ensure that the engine stops when the kill cord mechanism is operated. Make sure that the cord is in good condition. Always attach the cord securely to the driver, ideally before the engine is started, but certainly before the boat is put in gear. Stop the engine before transferring the kill cord to another driver. More information about this incident is available from the MAIB. The number of large commercial ships serving the Port of Southampton and the number of recreational craft afloat in local waters is increasing. It is essential that close quarter situations do not increase. Most of the commercial vessels you meet will have a UK pilot on board regardless of the ship’s flag. They will be listening to VHF R/T channel 12. 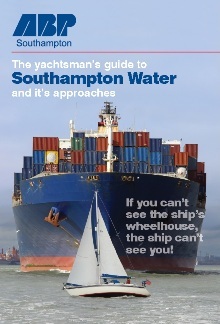 Most large ships travel at a manoeuvring speed of between 10 to 15 knots whilst in the Solent and Southampton Water. The lower limit will vary from ship to ship and is “as safe navigation permits”. For various reasons, ships travel faster than you might think, even in congested areas. Light, partially loaded or unevenly trimmed ships may require to maintain a higher “as safe navigation permits” speed in order to remain under full control. It takes less than 10 minutes for a fast ship to reach you from the visible horizon in clear weather, and in hazy conditions it takes a lot less. At 10 knots, a ship travels 1 nautical mile in 6 minutes; at 15 knots it takes only 4 minutes. Large deep draught ships cannot easily avoid small craft in narrow channels – it is up to you to stay clear. A ship that is slowing down does not steer very well; it needs the propeller action on the rudder to respond. When the ship’s engines are put “full astern” its manoeuvrability will be affected. Remember that it takes time and considerable distance for a ship to stop. There are numerous other small vessels operating within the Port of Southampton. Watch out for ferries, hydrofoils, tugs towing barges (especially at night, when unlit barges may remain invisible). Remember that a towing cable may be partly submerged and therefore extremely dangerous. Avoid sailing in the commercial ship channels, especially in poor visibility. Obey Rule 9 of the ColRegs for conduct in narrow channels by keeping to the starboard side of the channel and crossing only when this does not impede the passage of a large vessel that can safely navigate only within the narrow channel. Do not underestimate the speed of ships. If you boat is slow, allow sufficient time to take effective evasive action in the vicinity of large ships. Be visible. At night make sure your navigation lights can be seen. If you see the navigation lights of a vessel and you think you have not been seen, get out of the way. Use torches, search lights or a spotlight on sails, or fire a white flare to indicate your position. Carry a radar reflector high on your boat. Remember, from the bridge of a loaded container ship or large tanker, the captain or pilot will lose sight of you a third of a mile ahead, although you can see the ship at all times! Be alert. Look around every so often, especially astern. Keep watch at night. Even on a clear night you will have difficulty seeing a big ship approach. You might see it first as a black shadow against a background of shore lights, or as a growing shadow – at that point you are not far apart. Remember that your lights will not be easily spotted from the ship. Watch the ship’s lights. If you see both sidelights, you are dead ahead – MOVE OUT FAST. Be aware that ships alter course at WEST BRAMBLE and CALSHOT. You must be sure of your position and be aware of other vessels operating around you. Know whistle signals. Five or more short blasts on the whistle means "Your Intentions are unclear". Check and see if it is for you - and if it is - GIVE WAY. Three short blasts means “My engines are gong astern”. Know flag signals and shapes. A large ship which displays a cylinder on her yardarm during the day or three red lights in a vertical line at night indicates that the ship is severely restricted in her manoeuvrability. Please give her a wide berth. Keep your VHF R/T tuned to channel 12, the Port working frequency, and listen for traffic information from the Harbour Master’s Operations Room; Call Sign VTS )Vessel Traffic Services). If you believe you have not been seen or you are unsure of a ship’s intentions, call them on channel 12, then shift to a working frequency (6 or an alternative) for internship safety messages. Click the Image above to view our Guide. or visit THIS PAGE to download a printable version. 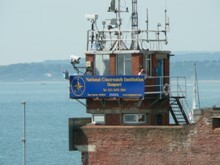 Click HERE to find out about "National Coastwatch" look-out stations in the Solent area, and how to contact them. ABP Southampton's Charity 2019: Click here to find out how to get involved.